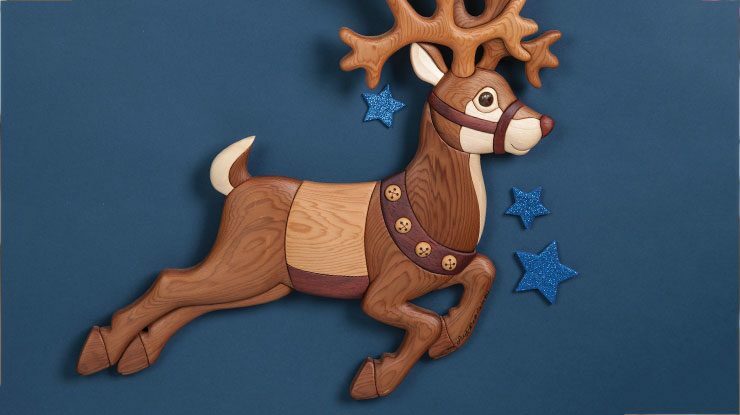 Flying reindeer are as essential to the holidays as Santa himself; songs, classic cartoons, and even poems pay homage to these sprightly creatures. This intarsia design, caught at the moment of takeoff, is my addition to the mythos. For the most part, this is a simple design. Photocopy the patterns and cut the individual pattern pieces. If the grain direction and color are the same, like on the hind legs, cut the pattern to include both legs. When separating the legs, use a very small blade, such as a #0 or #1. Attach the pieces to the wood, and cut them out. Some will require intricate cutting, but most of the cuts are simple. To make the project even easier, before you cut the pieces for the eye and jingle bells, drill the holes marked on the pattern for the dowels. Dry-assemble the pieces as you go to check the fit. Adjust as necessary; you might need to cut carefully along the line to remove any protrusions. Remove the patterns and number the bottom of each piece. Shape the pieces as desired. Drill a small hole in the upper part of the eye. Sharpen a small piece of white wood in a pencil sharpener, add a touch of glue to the hole in the eye, and insert the pointed wood into the hole. Cut off the excess and sand it smooth. Add the burned details with a woodburner. Hand-sand all of the pieces to remove any cross-grain scratches or pencil marks. Apply a clear satin polyurethane finish, such as Old Masters©, according to the manufacturer’s instructions. Let dry and repeat twice more at eight-hour intervals. 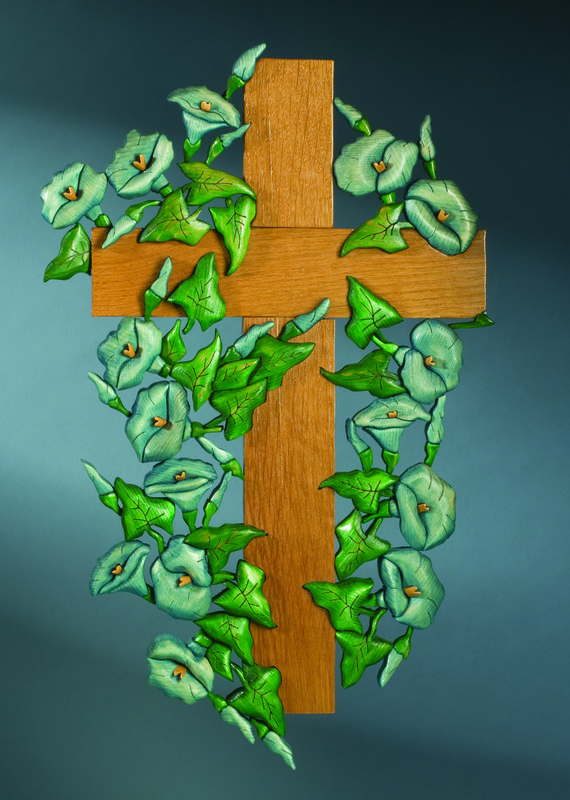 Assemble the project on a piece of paper lightly dusted with spray adhesive. Trace around the assembly, use spray adhesive to attach the tracing to the backing material, and then cut inside the lines. Carefully glue the pieces to the backing board using Aleene’s© tacky glue, starting with a few exterior parts to lock the project in place. Let the assembly dry, find the balance point, and attach a D-ring hanger to the back. 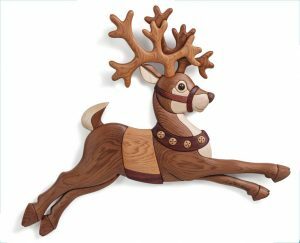 Find the full Prancing Reindeer Intarsia project in our Winter 2018 issue of Scroll Saw Woodworking and Crafts (#73). Download the bonus pattern below. 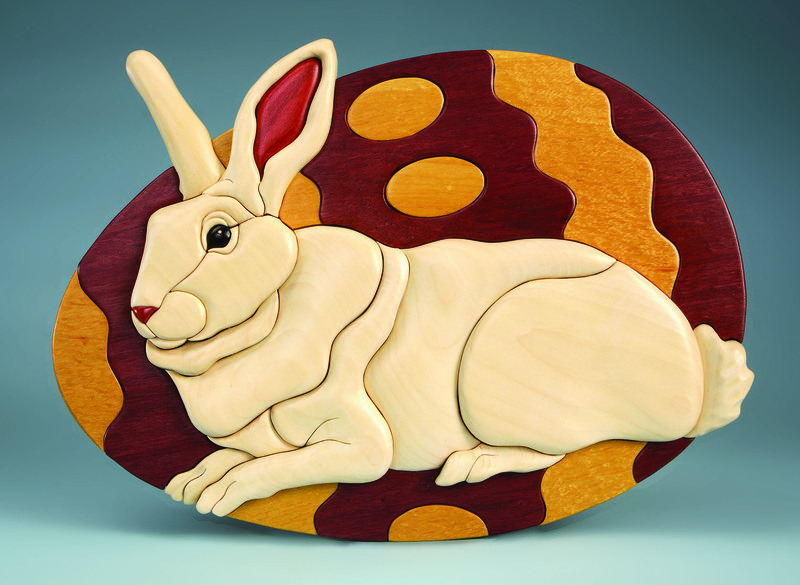 Judy Gale Roberts, born in Houston, Texas, has long been recognized as the leading authority on intarsia. 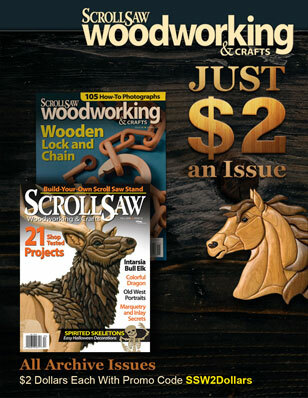 Judy was one of the first ten people to be inducted into the Woodworking Hall of Fame. For more of her work or information on classes held at her home studio in Seymour, Tenn., contact her at 800-316-9010, or visit intarsia.com. Judy’s numerous intarsia books are available at foxchapelpublishing.com. A pattern for a Santa to go along with your reindeer is also available at intarsia.com. Click HERE for more free Winter scrolling projects. 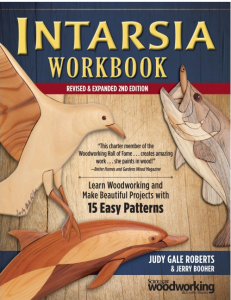 Check out the Intarsia Workbook, Revised and Expanded 2nd Edition, by Judy Gale Roberts. 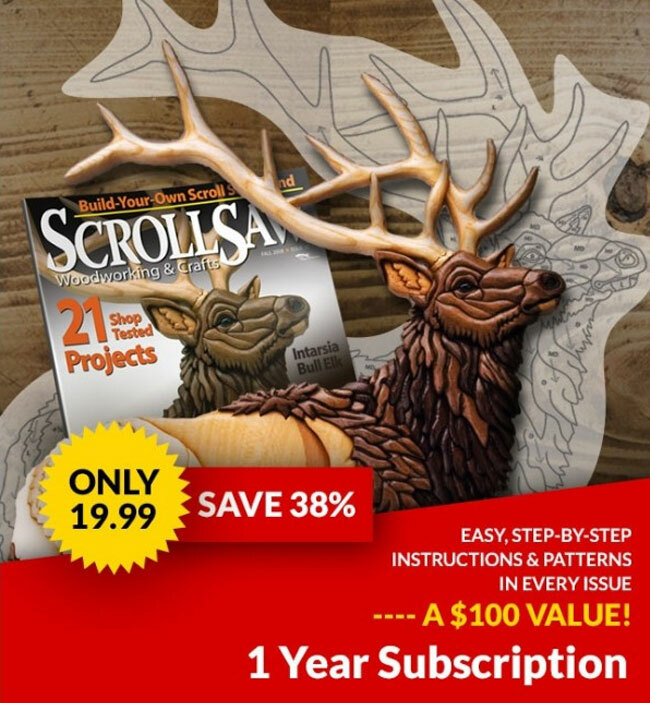 Master intarsia, the art of making picture mosaics in wood, with 15 skill-building projects that can be completed in just a weekend. Learn how to cut, shape, and assemble your own intarsia masterpieces with step-by-step instructions and all-new color photography. Available for $15.99 plus S&H (parcel post) from Fox Chapel Publishing, foxchapelpublishing.com, 800-457-9112, or your local retailer.